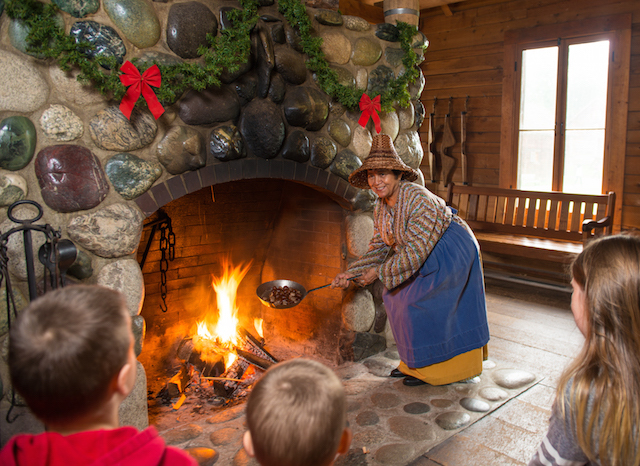 Starting Saturday, December 17th, you can enjoy Heritage Holiday at Fort Langley. Taste chestnuts by the open fireplace, craft a handwritten letter with pen and ink for a loved one, then relax with coffee or lunch at lelem’ at the fort Café. The cooperage has been transformed into a holiday workshop where you can watch chestnuts roasting on an open fire from 11:00am to 4:00pm, plus, catch the cooper making barrels every hour on the hour. Watch a blacksmith demo every hour on the half-hour mark (maybe you will find that lump of coal you’ve been seeking for someone’s stocking). Get crafty at the family craft station. Listen to musicians midday in the Big House. Relax at lelem’ at the fort Café with lunch or a warm treat. Don a heritage costume and pose for a group photo at our holiday photo spot. Share it with the hashtag #fortlangleynhs. Celebrate an entertaining holiday rendition of the interpretive program, Fur Trade Wedding at 12:00pm and 2:00pm. Be forewarned: it could be you tying the knot! Complete the Twelve Days of Heritage Holiday Scavenger Hunt to earn a treat. Taste authentic 1800s cocoa with the Heritage Hot Chocolate Tasting samples 11:00am to 4:00pm. Put down the phone and write a handwritten note using authentic pen and ink on souvenir HBC-inspired cards. Heritage Holiday at the Fort take place December 17-24 and December 27-31, 2016, from 10:00am to 5:00pm. The site is closed December 25, 26 and January 1. See online details for pricing info. * Don’t forget to order your free Parks Canada Discovery Pass for 2017!